Pie pumpkins, Spaghetti squash, and a few Sunshine kabocha. Alternative title – More about Squash than you EVER wanted to know. Well, we got our first kiss of frost the other night. Just enough to take out the squash vines and make the tops of the pepper plants a little upset. The season really IS almost over. The frost prompted us to pick all of the remaining winter squash, (planted May 13th – hello 4 1/2 month growing season). Frost on the pumpkin might be the romantic image of fall’s arrival, but in reality, more than a light frost can damage the crop you’ve spent the last 4+ months growing. Better safe than sorry. 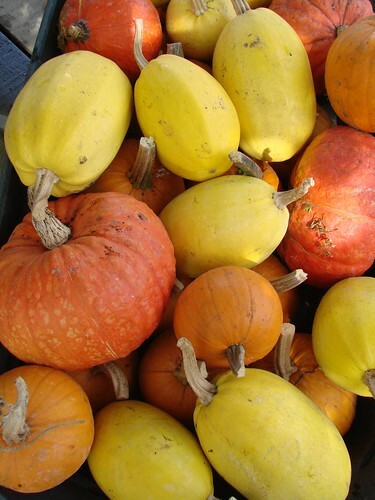 Winter squash comes in four major species: Cucurbita pepo, C. moschata, C. maxima and C. mixta. (Note: convention is to spell out the genus, in this case Cucurbita, once, and then abbreviate it to its first letter the rest of the time. That’s what I do in this piece. Convention is also that genus is capitalized and species is not, and genus/species is always italicized.) See this post (towards the bottom) for a rundown of which squash varieties fall where, or google for a more complete list. C. mixta isn’t commonly grown in the U.S. except in very hot areas, so I’ll skip discussing it here. What most people don’t know is that different species of squash have different keeping abilities, and often don’t really come into their own until they have been stored (cured) for a certain length of time. C. pepo is best when cured for a couple of weeks and then eaten within a couple of months. C. maxima is best after its cured for a month, and can store into January if not longer. C. moschata (butternut) also needs a month to cure, and can last 6 months or more after harvest. Often, store-bought squash isn’t of the best quality. 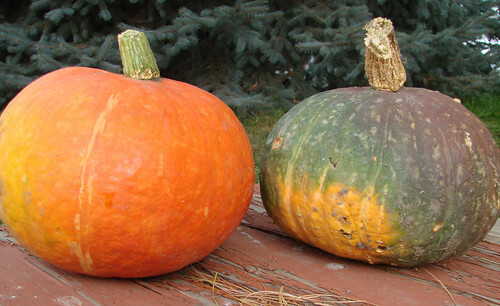 Because it is sold by weight, growers often harvest early, after the squash changes color but before it is fully mature. So the squash look pretty, but don’t taste like much. As squash matures, a lot of the water weight gets converted to starch or sugar, which makes for much better eating. I try to wait as long as possible to harvest my squash, yet still have it for market from mid September to the end of October. Here’s a good article from Johnny’s Select Seeds on growing/harvesting squash for maximum flavor rather than weight. I have a limited area in which to grow squash. I plant one 5 ft x 100 ft area with 20 hills of squash (average 2-3 plants per hill). So I’m pretty selective about what I grow. This is partially based on what I personally like, partially based on what I know sells well, and partially based on size. I don’t know too many families that really want to bake and eat a 20 lb Hubbard or banana squash, and I don’t want to haul them to market and back multiple times, so I don’t grow them, even though they store well and might taste spectacular. The main squash event this year was the attack of the evil squash bugs. I saw a few of them last year, at the end of the season, on some pumpkins. I looked them up to identify them. They didn’t seem to be doing much damage, and so I just left them. And then we had a very mild winter. I don’t think the ground ever really froze. And the squash bug population exploded. I sprayed for them 3 or 4 times, alternating between pyrethrin and neem. And those sprays do work on contact (be careful to avoid spraying when there are a lot of bees out). But there were SO many squash bugs, at all different sizes/stages of life, and it was impossible to really reach all of the undersides of leaves, which is where the eggs are. Evil evil insects. They worked their way from one end of the squash patch to the other, starting with the pumpkins, wilting or killing vines as they went. They seemed to prefer the C. maxima and did a number on my Cinderella and Kabocha squash. The plants that survived looked sick and sad almost all season. Lesson learned. Spray early and often. And hope for a hard winter. 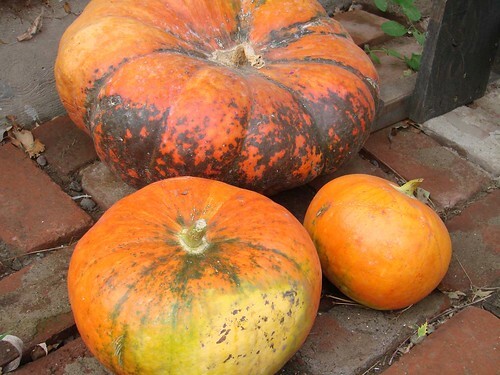 This year I grew three kinds of pie pumpkins (New England, Spooktacular and Baby Pam – all C. pepo). They did pretty well, in spite of the squash bugs, probably because they mature so fast. I grow pie pumpkins because they are easy, mature quickly, sell well, and can be eaten as well as purchased as decoration for Halloween/Thanksgiving. But in reality, if it were just me, I’d probably skip the pie pumpkins and just make pie out of other squash. I find all pie pumpkins a bit stringy. (The pumpkin you buy in a can…not actually a pie pumpkin. Most likely Dickenson’s Pumpkin, which looks like a butternut and can reach 40 lbs. It’s a C. moschata.) That said, this time of year, we eat a lot of pumpkin custard, which is basically pumpkin pie filling made without the crust, and poured into small ramekins. (If I’m watching calories, I’ll make it with a spenda or stevia-for-baking blend, and recently I’ve been making it with almond milk because I had some on hand. I throw all ingredients, including the cooked squash, into a blender, so no mashing of the squash is necessary). A small squirt of whipped cream on top when its done and its a wonderful packed-with-vitamins-and antioxidants desert. Cinderella pumpkin. The one in the back almost got to full size, but didn’t really develop the ridges it should have. The vine died before it could finish growing. I grew Cinderella squash this year (Rouge Vif d’Etampes – C. maxima), primarily as an ornamental. (There are a lot of differing opinions on the eating quality of this one). I saw some last year and just thought they were gorgeous. They look like the pumpkin coach in the Cinderella story. But the squash bugs got the plants early on, and most of them died. I did manage to harvest one decent sized one. I’ll try again next year. Sunshine on the left, Cha-cha on the right. Note the fat stem. This is indicative of C. maxima. Next came the Kabocha types. Kabocha is also called Japanese squash, and is known for its very sweet dry nutty flavor. It’s related to Buttercup. It’s another C. maxima. I planted Cha-Cha and Sunshine, both from Johnny’s. 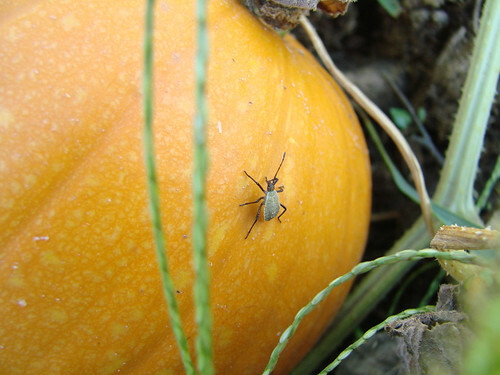 The squash bugs loved these too, and they took out several of the plants – especially the Cha-Cha. So the harvest was small. The rind on these squash is also fairly soft, so I learned the hard way that if you leave them sitting on a wooden table, the cracks of which are home to earwigs and pillbugs that come out at night, they will eat holes in the bottom of the squash where they can reach it. Sigh. Bastards. Another lesson learned. (Earwigs, contrary to popular belief, are NOT just decomposers – and are an axis of evil in my garden pest book. I couldn’t grow corn in Colorado because they would eat the corn silks and keep the ears from getting fully pollinated). Click on this photo to make it larger. How many squash bugs can you find in this picture? I count at least 10 on these two immature butternut. Next up, butternut (C. moschata). Butternut is tough to grow if you don’t have a good long growing season. They take a LONG time to start putting on fruit and for that fruit to mature. And they don’t set a ton of squash. The vines are very long – some ended up across the potato bed next door by the end of the season, some 10 ft away from where they started. But everyone loves butternut, and they store well, so are worth growing if your season is long enough. This year’s crop was OK, but not spectacular. I should save some seed. This was the only C. moschata I grew, so they won’t be crossed with anything. Spaghetti squash (C. pepo) isn’t my favorite, although I have learned that it is a lot more tasty if it is 1) completely ripe and deep yellow when harvested and 2) served with butter, salt and pepper and NO tomatoes of any kind. But it produces well and sells well. And being some 60 ft away from the original squash bug infestation, they produced very well this year. I had some that seemed to be a possible cross. They were more speckled than solid yellow, and were HUGE compared to what I am used to. I have several kinds of spaghetti squash seed, but didn’t keep good notes on whether or not I planted out two different seed packets. Sigh. I hate that. You can never take enough notes on your garden, EVER. Last up, Delicata (C. pepo). Delicata is also sometimes called sweet potato squash or zeppelin squash. It’s related to acorn and sweet dumpling squash. Very sweet. Somewhat drier flesh. A nice size just right for two people to split. And a skin thin enough that you don’t have to peel them. You can just chop them up, roast them, and eat the skin too. The plants are VERY prolific, and any immature ones (there are always a few at the end of the season) I boil up and then feed to the ducks and chickens over the winter. (I’m sure if I dug long enough I’d find a picture I’ve taken of a summer squash…but I can’t find one right now. I apologize for the lack of visual interest). I’ve realized that I’m just not much of a zucchini person. I’ve tried for years and years to like it, in about a million different ways (shredded, roasted, baked, stuffed, grilled, sautéed etc. ), and I always end up going “meh”. I like pattypans better for flavor. But summer squash are prolific and take little work other than staying up with the picking. I sell them at market for 25 ¢ each, any size, as a loss leader to get people to come to the booth. The chickens love them. The sheep and goats love them. So any extra get eaten, for sure. So I’ll probably plant 8 hills or so again next year. All summer squash are generally C. pepo, which means they will cross with your C. pepo winter squash, if you have both planted. Zucchini/Delicata anyone? For summer squash varieties, I planted eight ball zucchini, yellow pattypan and three different kinds of zucchini (I had someone gift me some seed packets so I decided to try them all out). The eight ball is very productive, but its hard to catch the fruit before it goes from baseball sized (perfect) to bowling ball sized (too big). They hold well, but people are freaked out by them because of the shape (they are round). So I’ll probably skip them next year. Interestingly, the squash bugs had the least impact on this variety, an observation confirmed by my farming neighbor R&R Produce, who noticed the same thing. I planted a spineless variety of zucchini (because I hate having my arms all scratched up when picking them and almost always end up scratching the fruit trying to remove it), and two heirloom varieties, Black Beauty and Black Heirloom. The black beauty was the best producer, until the squash bugs took it completely out in about a week. And the spineless…not really spineless, so not worth the bother to grow this hybrid. I’m starting to think that the pattypan just don’t like being near the zucchini, and should be planted in their own spot, as the production was spotty, and I had the same experience last year. I learned last year that the lighter colored heirloom varieties of zucchini don’t sell well, because once again, people think zucchini should be DARK green in color, not light green (and long, for the love of God, not round). So I’ve given up planting the lighter green varieties. It’s a fine balance between tender and fragile, and I try to avoid varieties with very thin skins, as they don’t hold up during the trip from the garden to the market. I think yellow squash is insipid (much worse than zucchini in terms of flavor) and so just refuse to grow it (because I can’t help but make a face any time someone buys it). Ha. This area is about 20 feet across. We planted no gourds to the right of about the middle of the picture. Last but not least in the C. pepo species are the gourds. Boy did we grow gourds this year. We have a lot of space in what we call our “perennial” garden, which is our side yard. 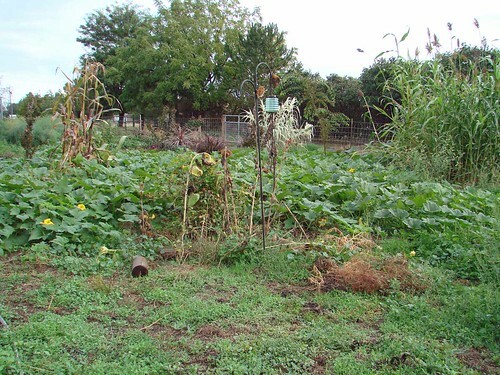 And I got the idea to plant a three sisters group of ornamental flour corn, dried beans, and gourds, to mirror the traditional corn-beans-squash planting. And the gourds took over the beans. They took over the corn. They took over the world. They collapsed the livestock panel we had in an arch to trellis them. But boy were they fun. It’s like a weird Easter egg hunt to harvest them. Many many different shapes and sizes. These were large and winged. I also had large, not winged, and very warty, small and warty, small and smooth, small and pumpkin-like. You get the idea. 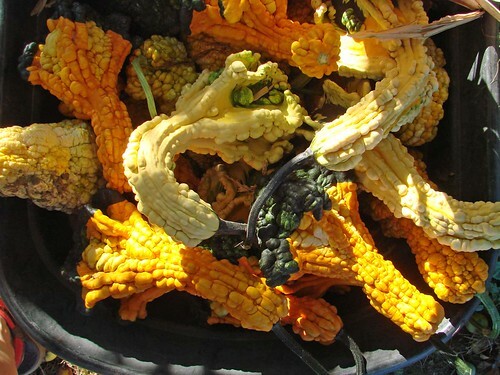 Miles Away Farm Blog © 2013, where we STILL have more gourds to harvest, and won’t likely sell them all. Anyone want some? Haha, I am totally with you on the yellow summer squash. I make a face whenever someone tried to give me some and I will never grow it. I didn’t plant any butternut squash this year because I thought they took up to much room without a huge yield, but I miss them. I will be sure to plant some next year. How fun! What an education I get from you. I bought the Cinderella squash, cut and roasted it, then added fresh Ginger, Nutmeg & White Pepper, two cups of broth and it made the creamiest, most delicious soup ever with no added cream or butter. (Roasted @ 350′ for an hour roughly and they start to caramelize) So after buying a bunch more, how in the world does one store them inside for the winter? Thank you in advance for any help in preserving them. (Did cut up and freeze some but would like to save at least one whole squash for Thanksgiving without freezing.) Also, would like to save the seeds to grow but am chicken after reading about the squash bugs, as we have a vibrant butterfly/hummingbird garden and don’t want to spray. Hi Pamela. 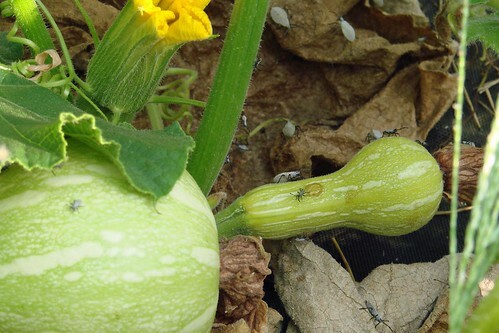 Cinderella squash is a C. maxima. That means that it should store into January pretty easily, as long as the skin hasn’t been injured. Squash likes to be stored at around 50 degrees, and 50-75% humidity. Usually an unheated garage is about perfect. No garage? How about a back room in the house that is cooler than the rest? Some people wipe down the outside with a dilute bleach solution (I’d go with 1 tsp bleach to a gallon of water) to kill any mold spores that might be present. I’m sure your squash will make it to Thanksgiving. As for saving seed, if you (or your close neighbors) didn’t grow any other C. maxima squash, the seeds should be true to type. You won’t know about squash bugs until you try. I had almost NONE last year. A lot will depend on your area. And there ARE organic sprays you can use. See my post for what I used. If you spray early in the morning/late in the day you can minimize impacts to the beneficial insects you want to protect, like bees and butterflies. I don’t think neem will hurt hummingbirds (and they don’t nectar on squash anyway). Neem has been used in India for thousands of years, and is an ingredient in toothpaste. Let me know how it goes. Thank you for your prompt response Jennifer. I shall try and grow the Cinderella squash from the seeds I saved, next spring, but our growing season in Northeast Ohio is fairly short; if we have a bad winter we may have frost into May and often my first plantings either have to start indoors or wait until May 31. I am a novice vegetable gardener and have always spent more time on my English Cottage Garden, which often requires a machete to tend. (Well it seems that way at times) I am encouraged by your notes and shall give it a go with the diluted bleach spray and store the squash in our garage until it falls below 50′. Thanks again for all of the information you posted-I learned more from your blog in one sitting than quite a few others in the course of the last week! Wilhemina, I sent you a personal message. Happy to answer questions. The email I sent bounced. So here is my response here. I probably spend 2 or 3 hours on each blog I write. I use wordpress.com, which is free, and hosted online by their servers. They have lots of designs to choose from, and it works for me. You can also do wordpress.org, which is a lot more flexible, and you can design your own page and do sales and other stuff, but that was more complicated than what I wanted to do just starting out. My learning curve with WordPress wasn’t too bad (I’m pretty comfortable on computers and ferreting out the info I needed to understand what to do). But it did take me a few weeks to really get comfortable. My best advice for doing a blog is don’t do one if 1) you don’t like to write and 2) you don’t have a lot to say. Blogs need to be current. There is nothing worse then clicking on a blog link only to discover it hadn’t been updated in 6 months. This really applies to all social media (Facebook, Pinterest, Instagram, Twitter, what-have-you). They can be useful and a great way to connect with people/customers, but only if they are organic and content driven and not done just because “everyone says I should do this”. They need to be personal, where people feel like they get to know YOU by reading them. Otherwise, it just becomes one more dreaded task on your plate. Make sense? There are other free blog platforms out there. I think I googled something like “best free blog space” or something and looked at several before I chose wordpress. Because I may someday take wordpress in a more custom direction, I went with that one. Blogger is the other main one, and tumbler, which I’ve not looked at. Hope this helps.